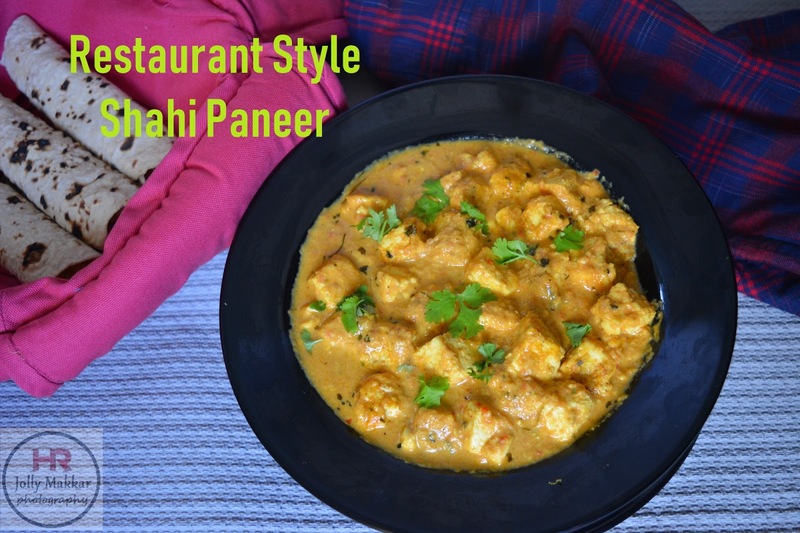 How to make Restaurant style Shahi Paneer recipe - Shahi Paneer is soft, delectable pieces of paneer cooked in a rich creamy base of almond and cashew. It tastes delicious with roti or rice. It is one of the most popular curries throughout the world. Paneer is known as cottage cheese in English. This is called "Creamy Indian Cottage Cheese Curry". The dish gets its name from Shahi, shahi is the term for "royal" and paneer for "cottage cheese". Paneer is used in making many different delicacies in Indian Cuisine and Shahi Paneer is the most popular of them. Shahi paneer is one of the most popular vegetarian curries in Indian cuisine. This aromatic dish is easy to cook and served as an entree in most restaurants and dhaba's. Shahi Paneer can be enjoyed with roti/chapati, plain paratha, naan or plain rice or jeera rice. Shahi paneer has little bit sweeter taste than Paneer Butter Masala. This is a rich curry and filled along with the butter and fresh cream I have also added cashews and almonds to make more rich & delicious. This is a good paneer recipe when you have guests at home or to make during a festival or family-friends get together celebration. This full proof recipe where no need to soak cashews and almonds, you can check the recipe !! Try this rich, creamy and yummy restaurant style of Shahi Paneer with step by step instructions. 1. Put the tomatoes, onions, green chillies, almonds and cashews in a big enough sauce pot. Add enough water to cover the vegetables and let it come to a boil.Drain the water and blend it to a paste. 2. Take a pan and heat the butter. Once hot, add in the ginger-garlic paste. Fry till golden.Add the onion-tomato paste. Cooked on medium heat for about 15 minutes, or until the oil separates. 3. Add salt and turmeric powder, chilli powder and let cook for another 15-20 minutes on medium-low flame. 4. Add 1/4 cup of the warm water. Cook for 5 minutes and keep adding the rest of 1 cup of water every 5 minutes, for the next 15 minutes. 5. Add the kasuri methi to the sauce and mix well. Season with salt. Add the honey. The honey adds a little sweetness. 6. Meanwhile, saute the paneer with a little butter. 7. Add the paneer to the sauce and cook for 2-3 minutes. Add finely chopped cilantro, fresh cream and if required a little more warm water. 8. Serve hot with naan, or roti. The paneer gravy looks absolutely creamy and delish Jolly. Addition of honey I'm paneer gravy is new to me. Will give it a try. Shahi Paneer looks so creamy and delicious. Thanks for sharing the recipe. Wish I can have that bowl right now, paneer is my favourite and this creamy and sinfully Shahai paneer making me hungry. yummy shahi paneer came out really like restaurant style, perfect thick gravy, rich look and I am sure about the awesome taste. Wow. Look at that creamy and delicious Shahi Paneer. It came out so perfectly. Your recipe is slightly different from how I make, this sounds interesting with honey, cashew and almond paste. Lovely share! 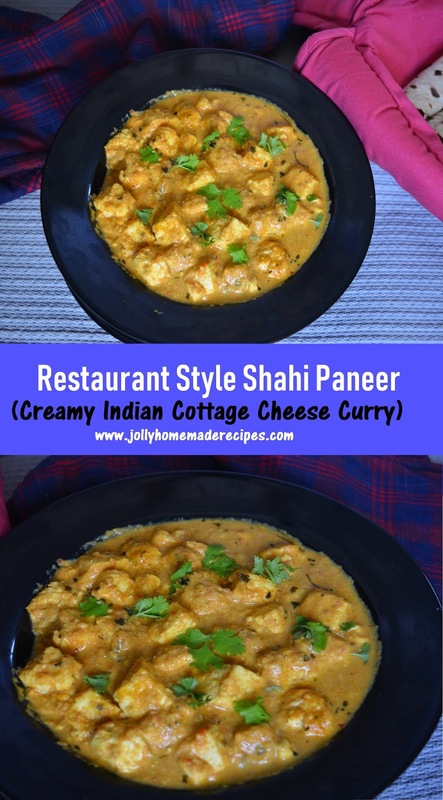 I love Shahi paneer and yours looks so delicious Jolly. Its making me hungry now.